ARRA News Service: Barack And a Hard Place - How Much Disdain for Americans Will Obama Show? Barack And a Hard Place - How Much Disdain for Americans Will Obama Show? Wow, bought gas today for 23 cents per gallon more than priced two days ago. When is the President of the United States going 1) to release oil from our oil reserves to keep prices down and 2) to unleash the American oil industry to DRILL NOW DRILL HERE in the Unites States? If he does not do these things, he will evidence a disdain and disrespect for the people of the Unites States of America and evidence to the world that he mirrors Giddafi in his disrespect of the people whom he is responsible to protect and preserve. Below are a reflective cartoon by William Warren and an extract of an article by Rick Manning. 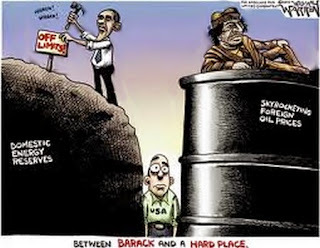 by William Warren: This cartoon is about Oil…and how Obama is dismantling our Domestic Energy Production while the price of Foreign Oil Skyrockets. Completely nonsensical…but then again, this IS Obama, afterall. By Rick Manning, ALG Director of Communications: $220 a barrel oil? That’s what the headlines on MSN blared, with oil industry predicting that the price for a barrel of oil could top the $200 a barrel mark if exports from Libya and Algeria are cut off due to civil unrest in those countries. For those who don’t follow the spot market on oil, that is more than double the current price for a barrel of oil, and is likely to lead to gasoline prices doubling from their already near historic highs. . . . [I]t is estimated that sustained oil prices of as low as $150 a barrel could plunge the economy back into recession. It doesn’t take an Old Testament prophet to predict that when gas prices are running in the $5-$6 a gallon range in 2012, that the standard liberal tactic to attack oil companies will be all the rage on CNN and MSNBC. While the Middle East turmoil may have been unavoidable, the Obama Administration’s mind numbing opposition to allow the development our own domestic national resources is either the height of incompetence or borders on treason for its deliberate impact of weakening the American economy. Any rational government would immediately open up as many sources as possible to begin producing domestic oil and gas rapidly. Instead, the Administration has declared the Eastern Seaboard off limits for drilling, has moved against proven oil drilling sites in the Arctic Sea, refuses to consider opening Alaska’s ANWR, and is dawdling in re-opening drilling in the Gulf. Nero had nothing on Obama when it comes to partying while his nation is in crisis. Of course, environmentalists are actively rooting for this economy choking development . . . 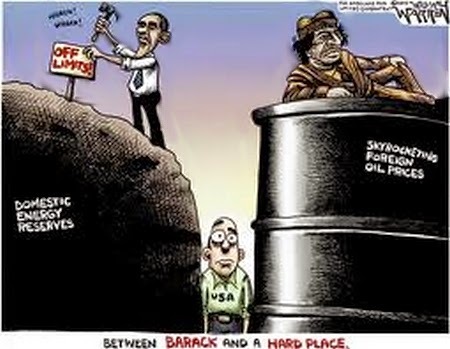 Tags: Domestic Energy, Foreign Oil, Barack Obama, Obama, Muammar al-Gaddafi, Gaddafi, Obama, Oil, OIl Prices, Political Cartoons, Price of Oil, U.S. Oil Production, William Warren To share or post to your site, click on "Post Link". Please mention / link to the ARRA News Service. Thanks! The results are desired by the left. This is Cloward-Piven. They seek to collapse the economy, and pick up the pieces. I just paid $3.57 for a gallon of gas today in Fresno, Ca! Outrageous that we are not permitted to use our own oil in this country while still giving millions of dollars to dictators in the Middle East! "President Obama‘s top economic adviser said Thursday the White House is monitoring the spike in oil prices as a result of uprisings in Libya, but said that recent fluctuations aren’t likely to derail the U.S. economic recovery." Now can someone please tell me how runaway oil prices that are basically due to the ineptness of the CIC (Clown In Chief) will not or cannot effect the current economy? Good Grief! They actually expect us to believe these lies!!!!! As to the current administration and it's stand on oil production here (my apologies if I'm a touch uncivil in my ranting today), I'm not sure why anyone should be surprised ad this clown's stance as to the oil situation. consider the fact that it took our boy 8 days to get his head far enough out of his behind to even comment on the Libya situation. 8 days! In the meantime gas prices are flying through the roof! Yet, his so called administration has the gall to believe we the electorate are really dumb enough to accept their claims that inflation is not happening! During his campaign, Obama was quite comfortable lecturing the electorate on the fact that he felt it was ok if gas prices when up to $5 a gallon or more. didn't matter to our wanna be dictator! Now as the Mid-East goes up in flames and he openly shows his disdain for Israel, he steadfastly refuses as you note to allow us to tap our own vast natural resources. His ideology dictates we as a country must be destroyed and become beholden to the third world garbage that is now and has been calling the shots in the U.N. for years. Our president is nothing more than a follower of a failed Marxist/Socialist system and on top of that every move he makes is also apparently aimed at supporting every radical Muslim order out there. As such, I see something much deeper going on here as to oil, although as always, it's just my view. Just let whites rise up against him and see how fast he responds and declares it a civil unrest and have us arrested. That is how much he hates whites; guess he hates America equally as much otherwise he would be telling the truth about unemployment. Why doesn't he bring back all the jobs that went to Mexico and other countries? It is $3.89 here in Brookings OR and $4.30 eight miles across the border in California. Yes tap the Reserves for ten years, that is protocol in a war time crisis, we have enough for 250 years and I am sure you could add another hundred years that we don't know about!!! Not to mention that due to technology we won't even be using the black goo in 250 years!!! I have been waiting for this for ten years. Not a chance with all of the corruption, we have been DUPED my fellow Americans. We must stop the lies and corruption in the outhouse, "I mean White House!!!" Hold these "Treasonous" chump politicians accountable for their ill actions damn it!!! We've got plenty of oil in the Rockies and in ANWR to last us another 50 to 100 years meaning, totallly independent before we'd start to need imports again. We could get this started and have oil flowing in about 2 years from the gulf region and it would take just 2 to 3 more years in the Rockies. I believe oil prices would drop within a year once the OPEC and others knew what we were doing and we'd be paying only about 1.50 to 1.80 a gallon! That would be great as we have not seen those prices in a long time. Where is Newt and his DRILL NOW DRILL HERE effort? Too busy pontificating and selling books. The energy issue has not been solved. The most critical part of the issue is that we (the people of the US) are being robbed (denied access) to our US domestic inheritance (our natural resources) which exist in our own back yards (America) by our own gov't, "green nuts" and the liberals ashamed of our country and progressives seeking control of our lives. I have lived in other parts of the world and have no feelings of guilt for our using the resources and technology that we have available [or should have] to us in the USA and our coastal regions. I say DRILL NOW DRILL HERE and build nuclear power plants, clean coal powered plants, dams where appropriate, etc. We have plenty of oil in storage as well as existing wells already drilled. Damn it!!!!!!!!!!!! We have been duped!!! Politicians are culls! Mark, You are right. Prices will drop the moment the world understands we're going to develop our resources. NEWS FLASH: drill baby drill or alternative energy takes YEARS to get a project going...permits for gulf drilling are on hold, solar is not affordable to the common man..we're screwd..this infrastructure should of been built decades ago. and our reserves DONT sit in a tank..it's still underground!!!! They want to destroy America and realize that restricting our supply of energy is the fasted way to do that.They want to destroy America and realize that restricting our supply of energy is the fasted way to do that. I'm tired of the Lies, I'm tired of the deciet, I'm tired of the Debt, I'm tired of Ovomit and his Criminal Organization, I'm tired of the Union! We can drill for oil and we can create more jobs right this minute!! America has always been a generation of go getter's and a show to the rest of the world that it can work.. Those far left Liberal Pansey's need to be forced out of office and let the people take charge!! Step down Muslim Ovomit and every member of your Communist Cabinet. Mark: Thank you! There's more of how I feel about this Criminal Administration, but I wouldn't be able to post it on here. I know.......same here. It would take a few pages. And then some! The switch to80% LNG national use would take less than 10 years, based mostly on the consumer converting to LNG vehicles, etc. The US hase the largest DEVELOPED Natural Gas resources in the world. Think about it, Perkins already has pitched his plan to several congresses. Jobs are being created like crazy in south Texas where they are tapping into the Eagle Ford shale. One of my son's works for a pipeline company and they say they will have work in the area for the next 10 years. The whole area is exploding and it is moving north into the central part of TX where the Eagle Ford is located. It only takes months to get a well into production and oil flowing in those pipelines and in the meantime, people are employed. BO doesn't care about the jobs - remember, he's been here two years and we are not better off than we were! Susan, Doesn't that shale method involve Fracking? Yes, Bryan, and the fracking method has been improved so much since the 80s when I first became aware of it when they drilled in the Austin Chalk which is a formation above the Eagle Ford. OK, lets just take a look backwards in time for a moment before Pearl Harbor was attacked, we did'nt have the man power or the ships or the fighter planes and weapons to win at that time. But within a few months everyone of our Grandfather's and Grandmother's were involved in a small sacrifice to help out in a civil service and jobs were created to build what was needed to fight Japan and Germany! They kept building and turning out more weapons that ever before and within a couple of years WE WON! WE can do this people, just do what our past generation has done. Susan: Your so right on that gal! I'm a proud 100% Texan, living here in Georgetown, and jobs are plentiful here.. The U.S. served the world well as global policeman! Obama destroyed the image --- projected us as weak and weak willed and that precipitated the whole world coming apart. We are quickly disintegrating into chaos and anarchy all over the world! This is very dangerous but serves the Socialists who can only erect their regime upon the ashes of another society --- so this was by design! Obama needs to step down now for incompetence at the very least --- he can probably be found guilty of high treason! He is intentionally weakening this country and its economy --- spending us into oblivion but enacting policies which force us to send our money overseas for oil! Defy him: DRILL BABY DRILL --- do whatever it takes to get us out of this mess now and then work on alternatives such as using algae for the production of both ethanol and biodiesel, solar panels, batteries and whatever else we can use instead of fossil fuels! But right now --- quickly --- this is an emergency --- drill, use the shale oil, coal and whatever else we need to do for transportation fuel and keep our money at home. Just this act alone would cure our deficit and weaken our enemies! LOL! Yep! Sometimes it is! Agree, Gail! Until we were attacked on 9/11 and fought back, the world viewed us as a Paper Tiger, thanks to the Clinton administration and their non-action when terrorists attacked. BO has bowed to everyone and been on this apology tour way too long and is nothing but a reactive administration. No one fears us any longer and the next two years could be disastrous, if it can get any worse, that is! I agree, DRILL NOW, and in the meantime develop alternate sources. The reality is that we will probably never be totally oil and gas independent. Thanks people! We're all freedom lovers together and have to hang together to take the country back! We need to get organized and funded the way the Left is. Some of those people you see protesting in Wisconsin don't have the foggiest what they're doing there! They are being paid and given signs as well as given the slogans to call out! Much of the financing all over the world is coming from George Soros and his many "philanthropic foundations!" We need to find elites and donors who agree with us --- get organized and show up by the bus loads --- descend on Washington --- and make ourselves heard over the din of these robots who don't have a clue and who are just doing what they're being paid to do by their unions! I saw this happen at one of the local townhalls regarding healthcare. There were some people with pro-Israel signs and a couple of these Union guys came over and asked for the signs. They were asked: "Why, are you pro-Israel?" and their answer was: "We were just told to go over and get some signs!" They didn't have a clue of what they were doing there! I'll bet they're busing people in from all over the place to protest in Wisconsin --- and if I were the Governor, I would declare all the representatives who went AWOL to have walked off the job and call new elections. This is a terrible precedent being set that if you don't like the way a vote is going to go --- you go into hiding to avoid voting! There is nothing that could be more destructive to the democratic process than that! The end result would be chaos and anarchy! Fire the bums! Elections have consequences and you have to be there voicing your opposition, casting your vote, even if you know you're going to lose! That's Democracy! Anything else leads to anarchy! Our Republican Representatives didn't go AWOL when the ObamaCare bill went down! They just made sure that the next election would throw things in their favor and it did! So, now these dictatorial despotic Democrats decide all on their own to violate their oaths of office by preventing a vote! Change the rules and vote and then get the bums out! Gail: Your right.. Texas, has taken a good step on the Immigration Bill by voting that we (Law Enforcement) will be able to bus all Illegal's arrested for Criminal Acivities and dumb them on the White house Lawn! If Liberal's want them here so bad, then they can take care of them. Look it up it's a fact.. Thanks for the info! I may be applying for an oil ind. position in NM after I escape Liberal Hell, WA. The prospects of solvent contamination are still pretty scary, though. It's a tough balancing act. Michael, i have been saying the same thing; if the White House want the illegals sure Michelle can feed them all from her veggie garden and they probably would camp out on the White House manicured lawns. Sure that would go over real well. ‎@Gail - well said!! My husband and I have been saying the same things! WE have to band together and take this Country back!!! God Bless AMERICA!! Nelda: Maybe Michelle can hire them to do the Job she and her Muslim Husband don't want to do.. I wonder what that could be! Lets all ponder on that for a minute, shall we. Thank YOU for starting this thread and the last article! I asked this before...Is it even remotely possible that the government has been restricting oil drilling and exploration to "SAVE" the oil for when the rest of the world runs out? Or, is that giving them too much credit? That gives them too much credit Edward...they are restricting because their "greenie" friends don't want them to...they can't upset the environmentalist. Edward... MY opinion is that Oblowme knew EXACTLY when he took office that it would come to this because he has known since the day he took office that Egypt and Libya and all the rest of the MidEast countries would be doing EXACTLY what th...ey are doing now and he knew it TWO years ago... OBLOWE hates America.. why?? BECAUSE HE'S NOT AN AMERICAN and he wants AMERICA in the CRAPPER. He is RESTRICTING oil drilling in AMERICA because he wants America to GO DOWN in flames. ALASKA ALONE has more OIL and natural resources then Libya and Saudi Arabia COMBINED!! TREASON IS PUNISHABLE BY IMPEACHMENT MR. O.. YOU AND BITEMEBIDEN ARE GOING DOWN!! He won't release it and if he does it will be sound like a lot but will in reality be just enough for a short while and make no damn difference. it will all be political garbage as he is so use to doing. WE need to drill here and drill now! There is no other way. We may have enough but it will run out in time and then what do you do when you have no new wells? HIGH PRICES and chaos which is what BO wants........Chaos! I'll add one thing BO had not counted on. I don't think he honestly believed that they the democrats would lose the House and the states would gain over 680 legislative GOP seats and 9 new govs! I think as Pelosi said that they figured they'd lose perhaps 25 seats and still maintain control. So that throws the Monkey wrench into part of their plans. Lots of good things are happening on the GOP side which have yet to rise to the top. WE are not lost yet! BO is toast if we get united. I am certain! When gas was 5 bucks a gallon, it was Bush's fault. It is going up now as a direct result of Obama and his drilling policies in the US and some middle east trouble, which he hasn't handled well, but now the libs say it is a repub. controlled congress who is too blame. Hummm, when it was "W" 's fault did he not have a democratic congress? Seems like to me that the dems are bring brought to light and they hate it lol. Obummer himself said that oil prices would go to $8 a gallon! Ofcourse he won't let it get that high...he will swoop in and be our savior and release some oil...and everybody will be in love with him again...but he will have to reason with us oil greedy people that we need fast trains and green cars...and we will just have to see that light because the anointed one saved us from $8 a gallon oil. Exactly right Mary Ann. I for one don't drink the Kool - Aid , and I just love a big V8 with dual exhausts! I live in the mountains and we would need a "plug" every mile or soo for those electric cars. lol Give me the flag, a way to make a living, my family, and a cabinet full of guns and keep all the "change" you want lol. Janis: Exactly right! American's are not failures and we want whats best for our Country.. The Enemy from within has got an agenda for America's future and he and his Communist party want to see this whole thing through, from destruction to... a socialized failure! He has already called the Constitution an Unconstitutional Document- Just who the HELL does he think he is? The Muslim Brotherhood has already infiltrated our Congress when he alone appointed a Muslim of the Brotherhood as our Homeland Security Director! Just another piece of the puzzle to enact Sharia Law under his command, and Oil is the biggest start of any war and he knows this "War within the United States against each other" Once we get Oblowme out of power We The People Must demand The Death Sentence be carried out on George Soros on counts to Destroy America and Treasonous Counts against the United States and it's People!! Oblowme Needs to be tried and sent to Prison for the rest of his Natural Born Life!! The ACLU needs to be destroyed and brought up on charges for assisting our Enemy for turning against America as well as the CIA's information! The Unions should also be brought down and the Mob Bosses tried for Unconstitutional acts against the United States! 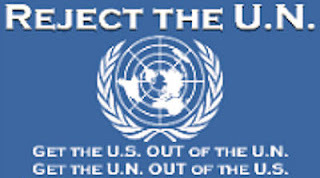 The IRS abolished as well as breaking away from the United Nations!! No more charities to any Country who hates America and it's Citizen's and declare WAR upon the Muslim Nation!! Think i read where the moratorium was lifted in late 2010 but with a little catch. The drillers will have to provide evidence that they can safely drill offshore. He is street smart and knows how to screw everything and everybody. The is a thug and has proved how dangerous he is to the american people. If he keeps on doing what he is doing, how much disdain will the American people show for him? We already want him to step down. Todd, I'm with you....I'm going to drive my big SUV....no little electric cars for me. I'm looking for safety and with all the big semis on our highways, a little Prius is just is not my style. Oh since a few are talking about big cars and SUVs, I like classic cars and last summer I purchased a 1995 Cadillac Fleetwood Brougham with low miles.........beautiful car! Big 350 corvette engine and its one nice ride. I'll buy big and blow fart fumes out of my exhaust into the nostrils of the libs! We found our 18 year old son a '68 Camaro last fall - blue with white racing stripes! Fun car. Mark, have you seen the show Car Czars on Nat Geo? Friday night they showed a guy who had restored a '69 Z28 to all the original parts, down to the custom color that may have been one of a kind - like a navy blue with white racing stripes. He spent $100,000 restoring it. I understand about this gas situation. Daughter told me today she filled up car last night and it was $49.00. She said if she waits another few days it may be more. The question is not how much he will show because even the smallest amount would be too much for a President of the United States; the question is "HOW MUCH ARE WE GOING TO TAKE?" Teri Parenteau Obama is an Anti=Colonialist. all learned from his KENYAN FATHER.... Beck had a whole week on this several months ago. Have you ever read THE ROOTS OF OBAMAS RAGE?? ?